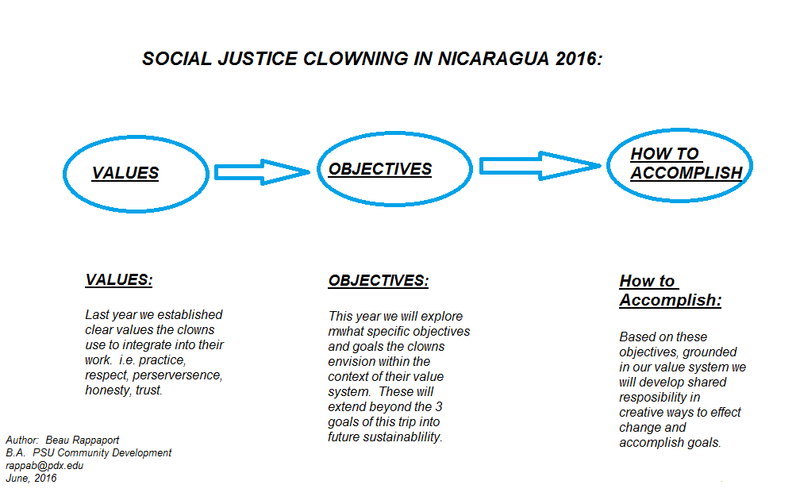 "Building relationships between students and sustainable community organizations in Nicaragua, through the study of effective change and application of Clowning in community development. Bringing meaningful, creative and sustainable change to affected youth in the Barrios of Nicaragua." Students will travel to Nicaragua and meet with a young Clown troop. The clowns work from La Escuela de Comedia y Mimo in Granada, Nicaragua. Students will meet the clowns at the school. From this base we will travel on short trips to other organizations in Nicaragua to perform. These will will consist of schools, organizations and social justice organizations. To strengthen relationships and share the art of clowning between with sustainable community organizations and PSU ISCD. 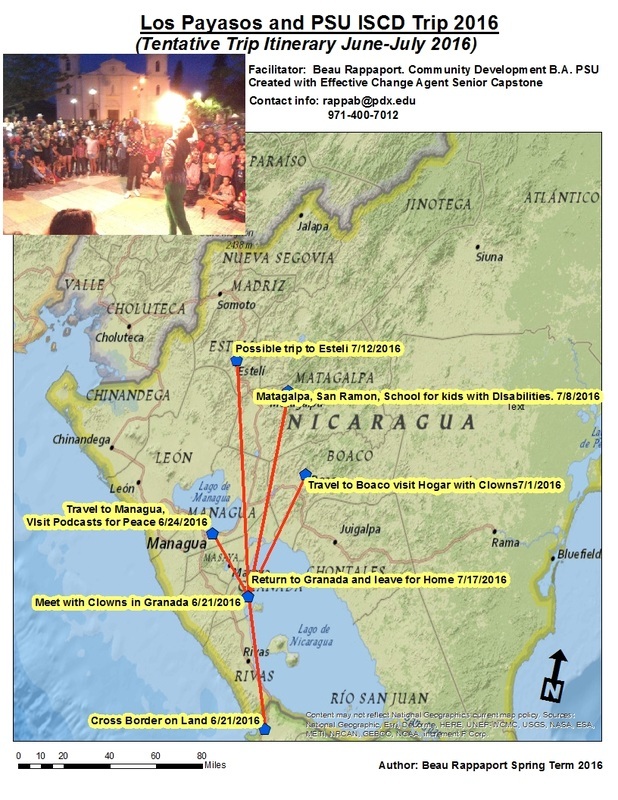 Students will spend spring term developing an itinerary for a 5 week stay in Nicaragua. The trip in country will be designed as a clown tour with visits to local organizations. To develop a network between community organizations internally within Nicaragua. Externally and internationally between students and these organizations. 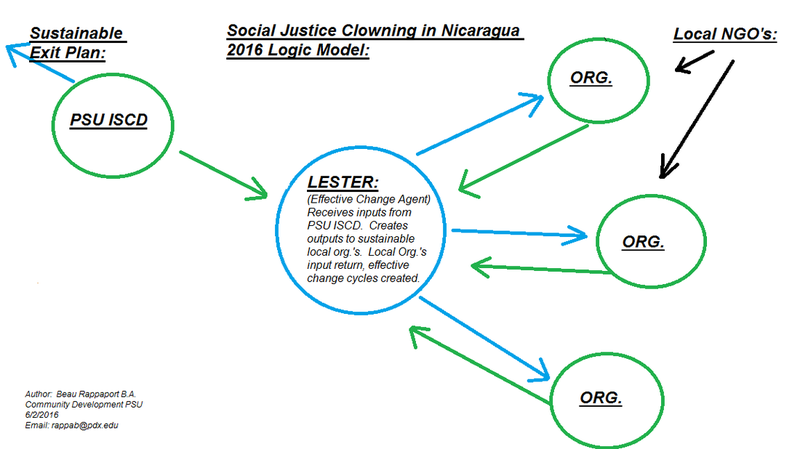 These connections will be utilized to create effective and sustainable change to youth, who are critically affected by poverty and violence in Nicaragua, which fluctuates as the 2nd poorest country in the Western Hemisphere. To develop a case statement and portfolio of work for the Clowns. The clowns have no formal organization. They have been dedicated to their work. This writer will spend time documenting their work and developing a case statement and portfolio in order to raise awareness of their work and move towards funding sources and sustainable opportunities for growth and networking.